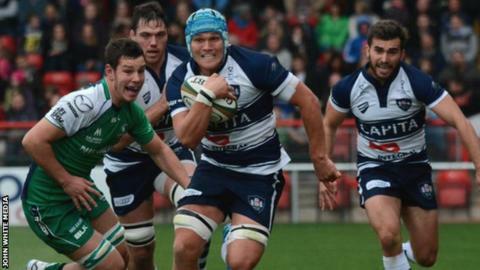 Bristol flanker Olly Robinson says he plans to give father and boss Andy a selection dilemma after scoring a hat-trick on his debut for the club. The 23-year-old was signed by his dad from Moseley in the summer. And the young back-row helped Bristol to a 50-34 win over Connacht Eagles in the British & Irish Cup on Sunday. "All I can do is play to the best of my ability and then I can have a few more arguments with my Dad about not picking me," he told BBC Radio Bristol. And when asked if his achievements had brought a smile to the face of director of rugby Andy, he joked: "It would have been the first one for 22 years if it had. "He may well be more disappointed with the four tries we let in rather than the ones we scored." Jack Lam and Ross Rennie have competed for the number seven shirt in the Championship this season, and Bristol have won all five of their opening matches. Lam and Rennie have 28 international caps between them - for Samoa and Scotland respectively - and Robinson is aware of the challenge he faces of getting in the Bristol side. Bristol relocated from the Memorial Stadium to Bristol City's Ashton Gate ground in the summer. Sunday's British and Irish Cup game against Connacht Eagles attracted a competition-record 7,640 supporters - nearly three times larger than this weekend's Premiership game at London Welsh. "When you look at who else is in my position, it's quite daunting for me," he admitted. "But in the same respect, they've been brilliant for me. "It's nice to have all three of use pushing and if I can push them to improve their performances then that's great for the team." Robinson's impressive debut on Sunday came in front of a cup-record crowd of 7,640 at Ashton Gate. And he added: "I was so happy to get out there in front of that crowd. It's so special and it's given everyone a taste of what it could be like for the rest of the year. "I'm not sure any of the tries were showstoppers but just being out there, on my first start for Bristol, I would have been happy. To contribute was fantastic."